BBM to come to Android and iOS this summer! 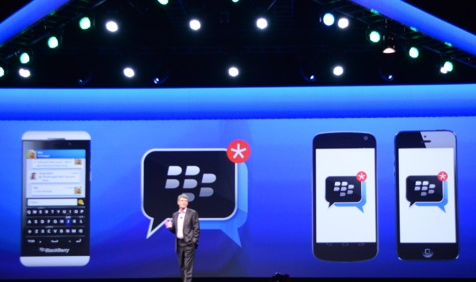 Blackberry have today confirmed that their popular messaging solution BBM will be going cross platform! With the messaging service set to arrive on both Android and iOS this summer! There are only a couple of remits which have to be filled for you to be able to make use of the free app and they include having a device running iOS6 or higher or Android 4.0 Ice Cream Sandwich or higher! After that there's not much more to know other then the fact that Blackberry want to start to bring features across bit by bit. They said they plan to begin "with messaging and groups, but we'll bring voice, screen share, and of course, channels later on." With the ultimate aim of maknig the BBM experience on the other platforms as fully featured as possible! Wow, we definitely weren't expecting that when we tuned into the stream! Heins said that, "It's time, to bring BBM to a greater audience" and that's definitely what this will achieve! WhatsApp, Kik and others will have a tough job on there hands adding in the extra features which BBM will have, but we do wonder whether or not Blackberry have missed the IM boat here? Asus announce 31.5" 4K IGZO TV! Nook Simple Touch - First Impressions. HTC confirm the One Google Edition! Amazon announce new 'Log-In with Amazon' service! EVLeaks tease the brown Galaxy Note 8.0! Oppo Find 5 goes on sale in Europe! Asus VivoTab Smart ME400C review! Huawei's super thin Ascend P6 pops up on EVLeaks! EE drop the HTC First before it even arrives! The HTC One is reportedly in 5 million pockets! Vodafone UK delay 4G roll out until September! The Xbox One event: Everything you need to know! Is this the Galaxy S4 Active? Yahoo drop $1.1 billion on Tumblr! Is this the Samsung Galaxy Tab 3 8.0? Sony has added the Xperia Tablet Z to AOSP!